Last week we kept waiting for a good weather day for hiking. But after three or four days in a row where the weather turned out better than the forecast, we decided to take the chance that Friday’s “30% chance of showers with possibility of afternoon thunderstorm” was likewise off the mark. We were on the road by 7:30 and driving through heavy rain at 8:30. 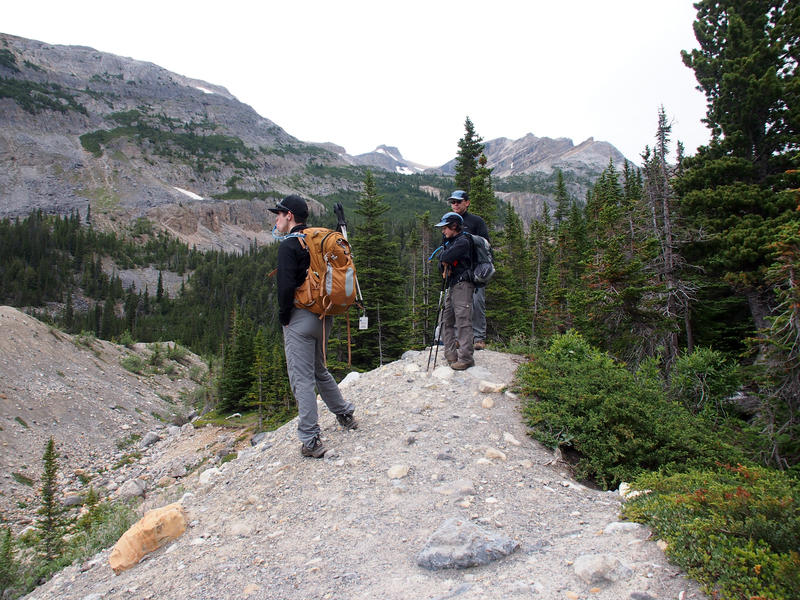 Fortunately, by the time we arrived at the Bow Glacier Falls trailhead, the rain let up. Cloudy skies and occasional light showers gave way to beautiful blue sky by the time we reached out turnaround point, so on the way back we added a quick side trip over the gorge to stop for lunch a short distance along the trail to Bow Hut. 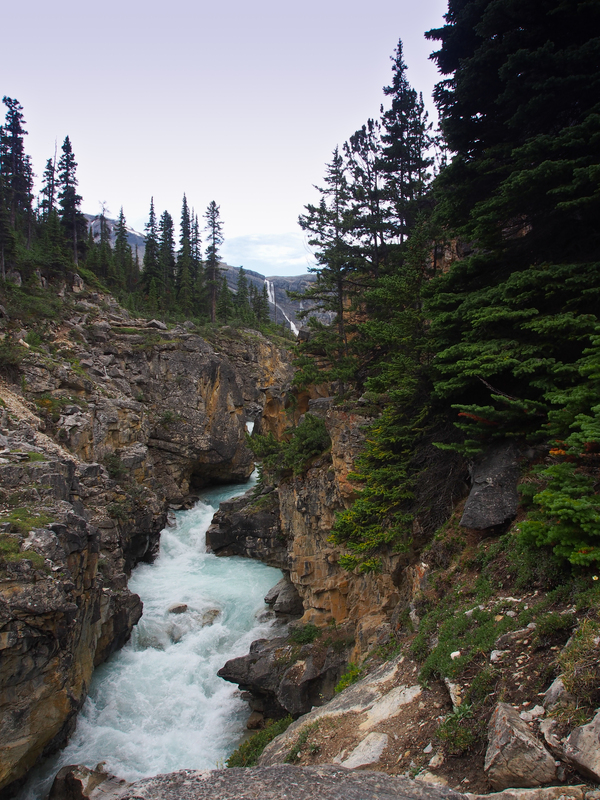 Of all the possible hikes in the Canadian Rockies, Mrs. GeoK selected this one because she really wanted to see the headwaters of the Bow River. 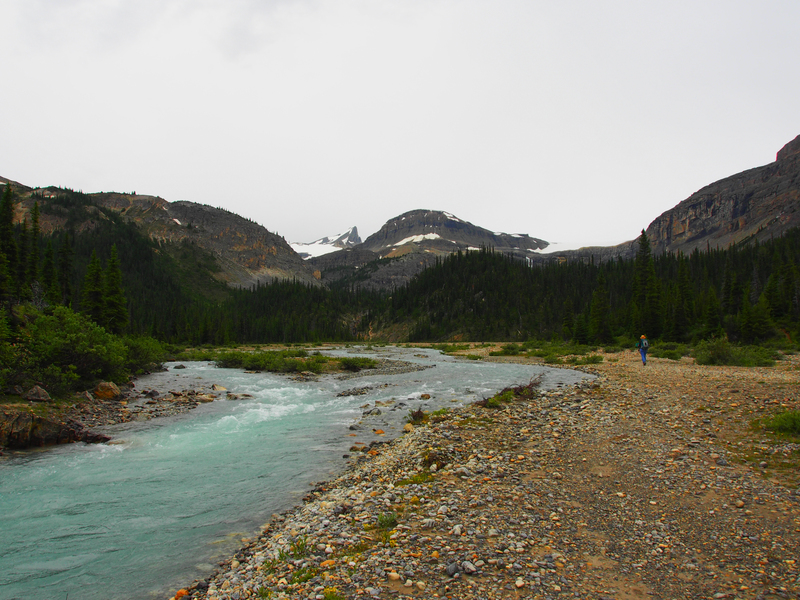 Our very first hike in the Canadian Rockies was up to Rae Glacier / Elbow Lake, headwaters for the Elbow River. 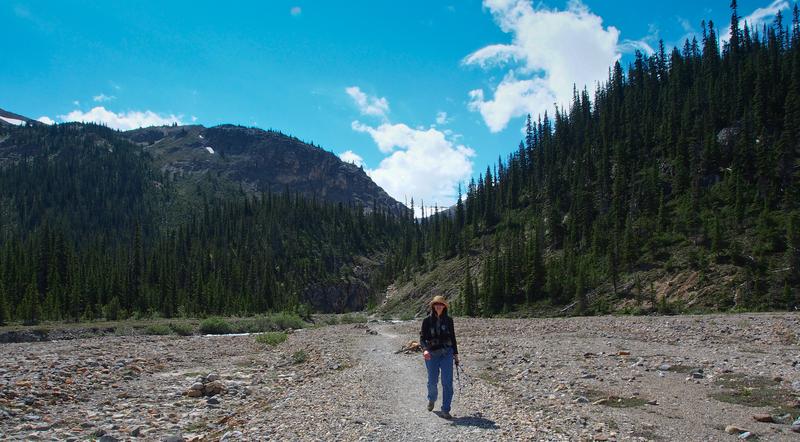 Eighteen years later, a visit to the headwaters of the Bow was past due! Driving time from Calgary, along the TransCanada and then on the Icefield Parkway (highway 93) towards Jasper, would be about 2 1/2 hours each way. A quick word about parking. We parked in the first parking lot, just off the highway at the turnoff to Num-Ti-Jah Lodge / Bow Glacier Falls. There are lots of public outhouses here. 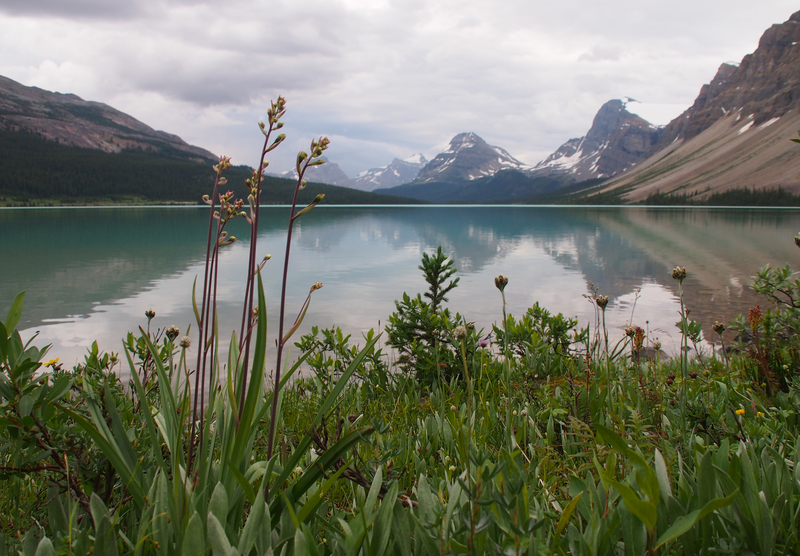 If you just want to take some photos from the shoreline of Bow Lake, park here. 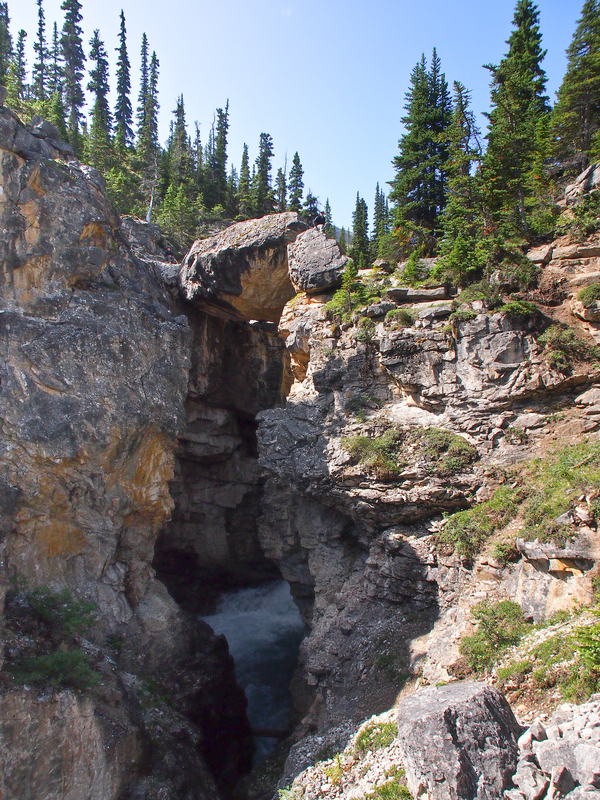 But if you’re planning to hike to Bow Glacier Falls, continue left past the lodge to the rear parking lot and where you’ll see the wooden bridge to the trail that follows the north shore of Bow Lake. Reflection of Crowfoot Mountain on the still surface of Bow Lake viewed from the north shore. 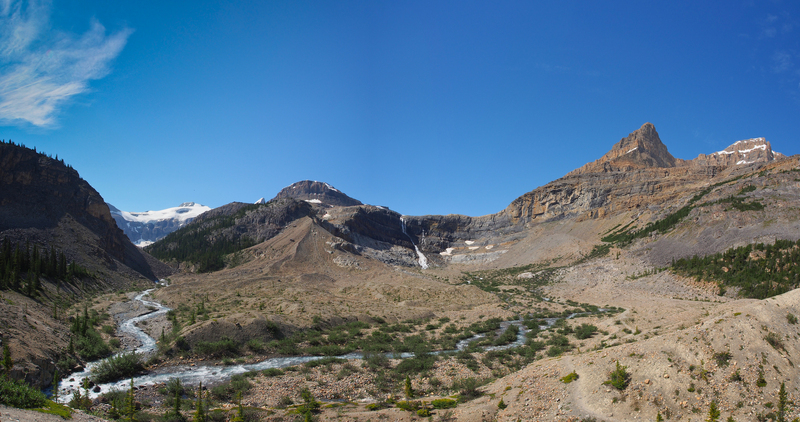 Looking just to the right of Crowfoot Mountain, Bow Falls is a thin ribbon down the rock face, with Bow Glacier hanging above. We were early enough that there were just a few visitors on the shore, including a professional photographer shooting a family portrait. Because it was so quiet, we managed to get a quick shot or two of a small flock of birds perched on a weather-bleached tree stump. 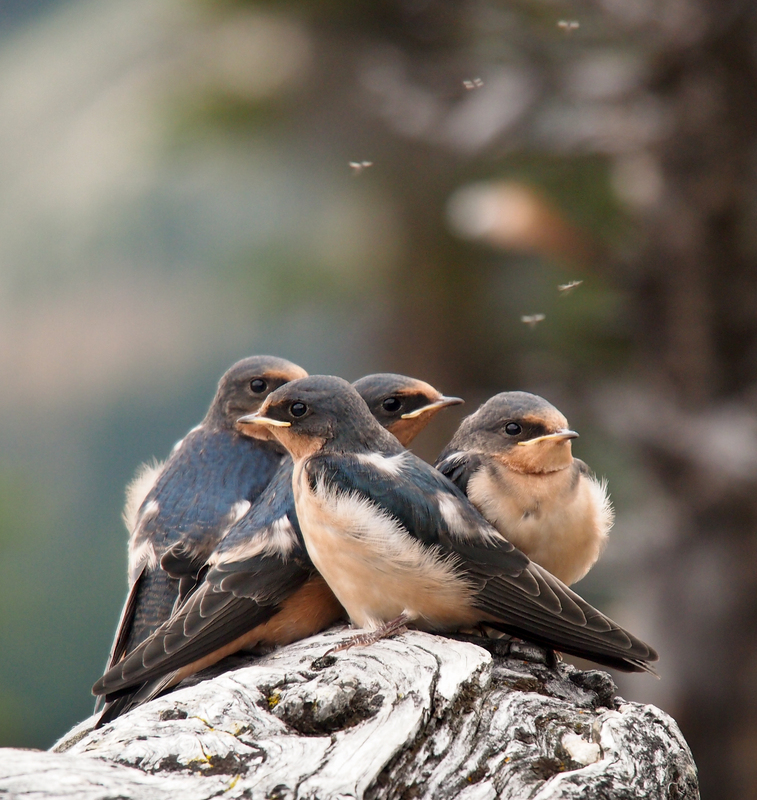 Despite looking through a few bird reference books, we haven’t been able to identify them, so if you know what they are, please let us know in a comment. NOTE – from this point on, mouseover photos for descriptions. 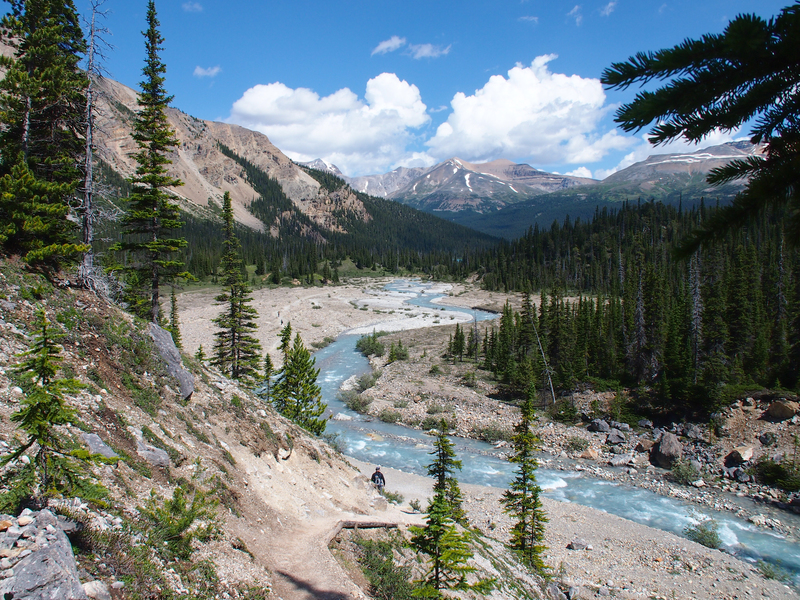 The well-trodden trail to the falls hugs the north shore of Bow Lake for about 2 km. 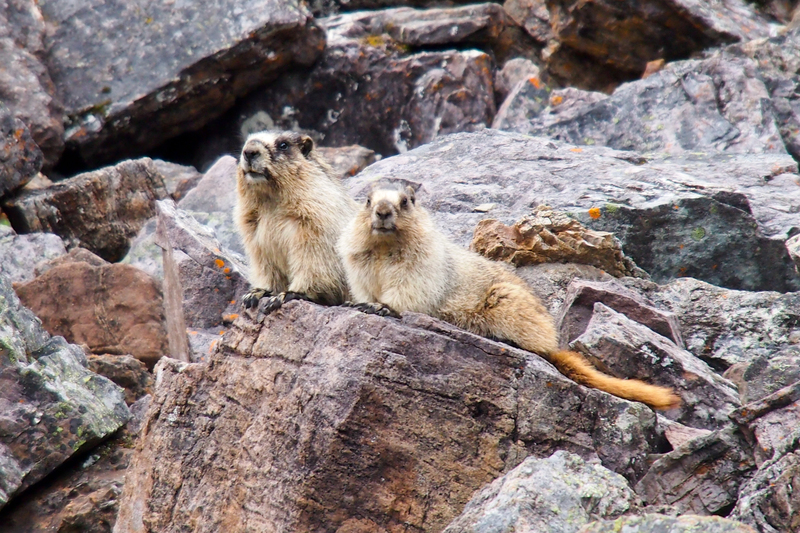 Wildflowers (including Scarlet Paintbrush, Yellow Paintbrush, Leafy Aster, River Beauty, Twinflower, three types of Wintergreen, White Camas and many more), the occasional marmot, the lake and surrounding mountains make this a very scenic walk. Approaching the head of the lake, gravel bars and a fan-shaped gravel bed foreshadow the large gravel plain we crossed before finally reaching a set of about 65 rough wooden steps. As we neared the stairs, a large group was coming down on their way back from a stay at Bow Hut, which is operated by Alpine Club of Canada. After exchanging greetings, we walked over to take a closer look at the outlet from the gorge. 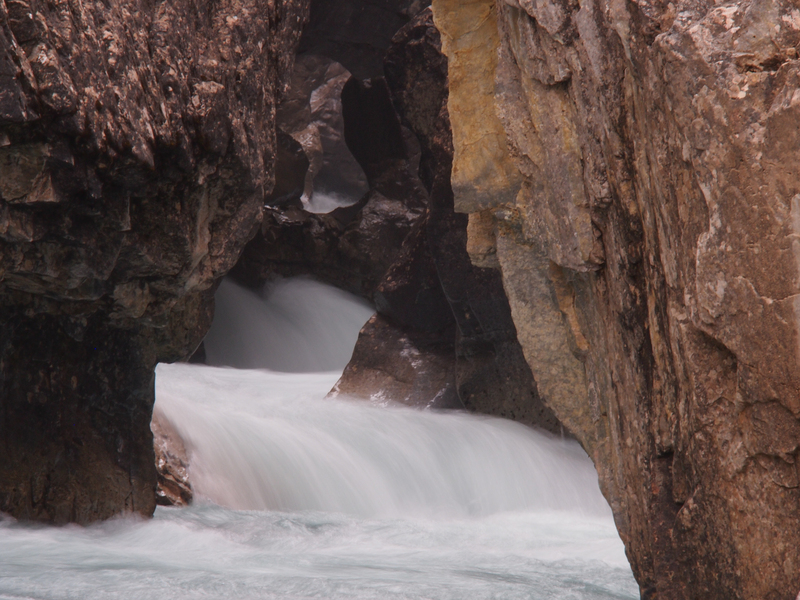 Just a few meters wide at the outlet, the Bow River roars out of the gorge onto the plain. The wooden steps are pretty rough – uneven heights and widths – and quite steep. Of the total 125 meter elevation gain for this hike, you gain almost half of it here and then the trail eases off to a gentle climb into the upper valley containing the falls. Anyone hiking with younger children will want to keep a close eye (or hold hands) along this section. 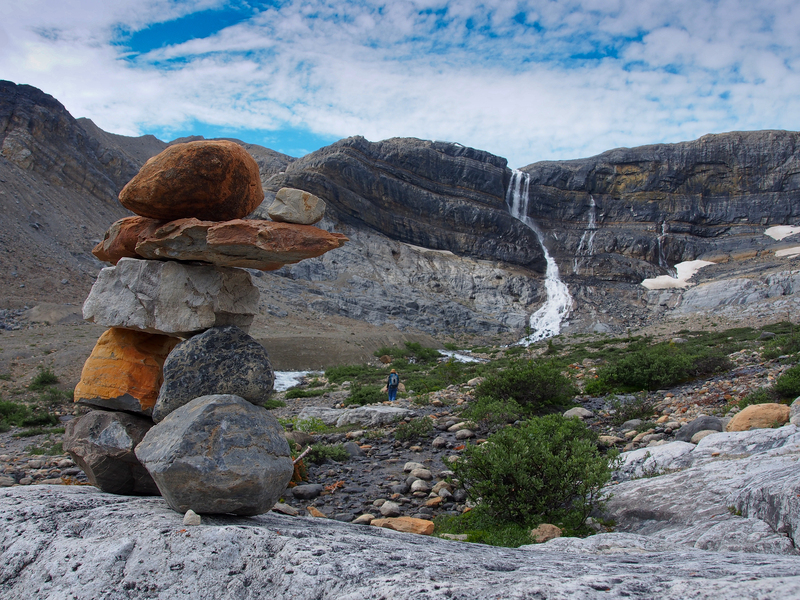 It’s maybe half a kilometer from the bottom of the wooden steps to the point where you stop paralleling the gorge and step out onto a little drumlin that overlooks the valley containing Bow Glacier Falls. It’s majestic and picturesque, and we all came to a full stop while we took in the scene. From the overlook, it’s about another kilometer to the base of the falls. You’ll want to be wearing waterproof boots or sandals here, as the valley bottom is a mess of interconnecting springs and creeklets, with rare sections of dry gravel. Since this was our first visit to the falls, we’re unsure whether these conditions exist into the fall. We spent almost an hour here, studying the various rocks on the valley bottom, watching the water pouring down the falls, taking lots of photos and even finding a geocache that was hidden here back in 2004. It was about 11 o’clock by the time we started back. Although just two other people hiked up to the falls while we were there, several small groups were coming up as we were going down. Since it was still early for lunch, we decided to add a short side trip to our return trek. Just about at the top of the stairs, there’s a natural bridge across the gorge – a huge boulder, maybe 2 meters high and 6 meters across. 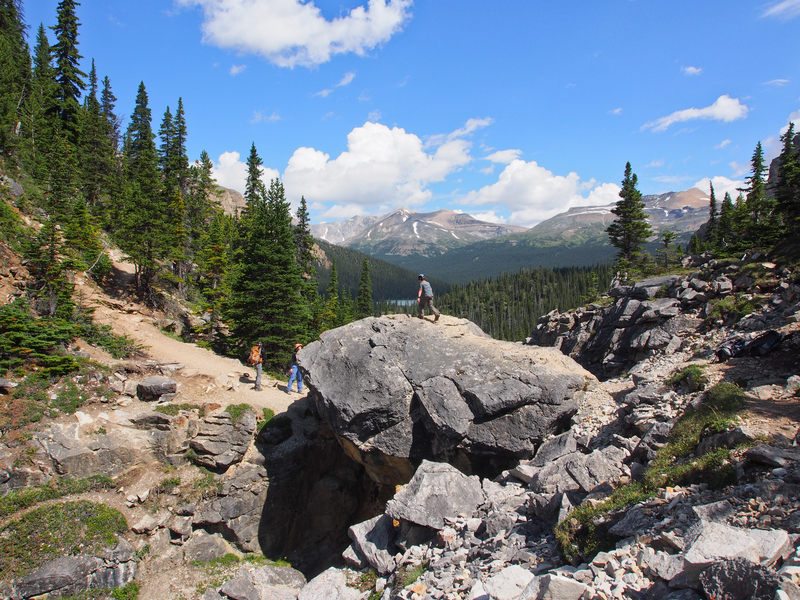 Intrepid hikers on their way to Bow Hut cross this natural bridge and hike another 3 to 4 km to reach Bow Hut. 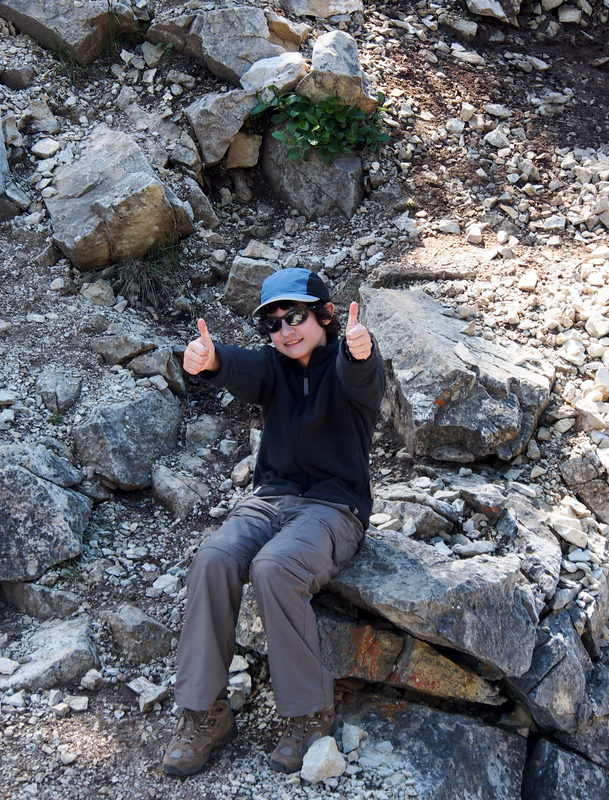 We crossed “the rock” and hiked another six or seven hundred meters before stopping for lunch at a grouping of large boulders where a gentle breeze helped keep the flies away. Crossing this rock “bridge” is not for everyone. K needed a bit of a hand up onto the first foothold. We took our packs off and handed them up to Mr. GeoK, who carried them across one-by-one, so the rest of us could climb up and over without a heavy pack affecting our usual center of gravity. Acrophobes will most likely have trouble here, as there’s nothing but your own sense of balance between you and the gorge. In fact, some online reviews for Bow Hut trail mention this crossing as a big negative. 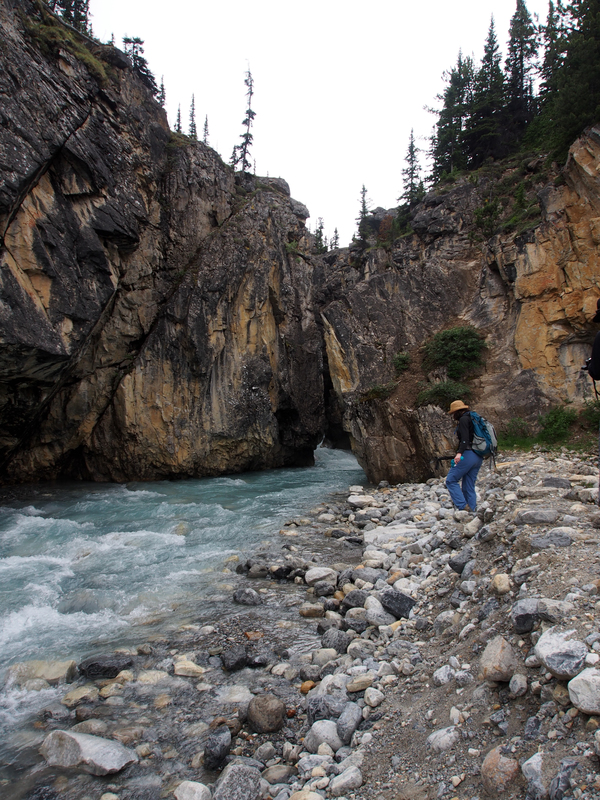 For others, crossing the rock bridge is an essential detour en route to Bow Glacier Falls. In fact, a group of 5 or 6 women waited patiently for us to cross before crossing themselves, each one pausing on top for a photo. They never did pass us after we sat down for lunch, so we assume they crossed right back over and continued to the falls. Anyhow, we got back to the parking lot shortly after one o’clock. Allowing for just about an hour at the falls and 45 minutes for our lunch detour, our total hiking time was somewhere between two and two and a half hours. Our rating – Easy. K called this on a “walk in the park.” A little extra care should be taken on the wooden steps and the rising section into the valley, where there’s a steep drop-off. Excellent description of hike and great photos. You are right about the suspended rock particles (glacial flour) influencing the colour of the lake. In fact as the melt rate varies with the season so does the colour of the lake. 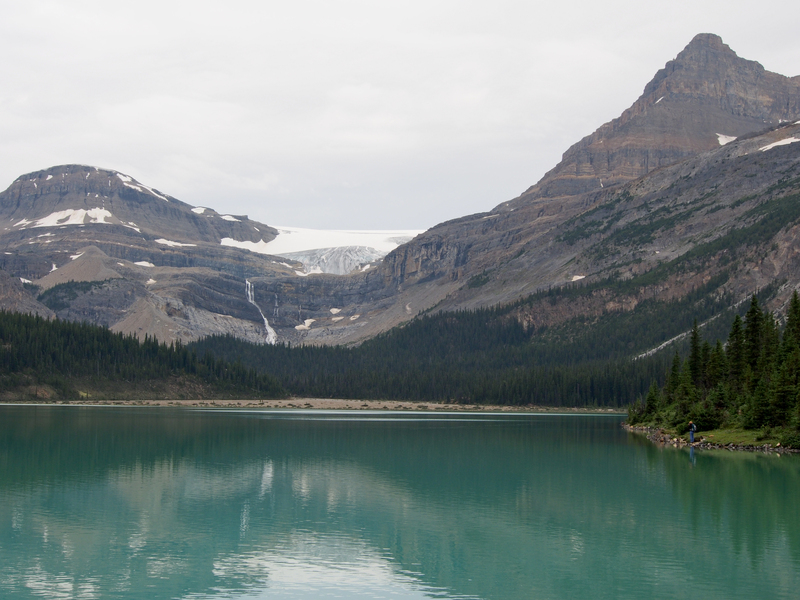 This is especially noticeable in nearby Peyto Lake where you have good angle on the view of the lake. I am compiling a series of articles on the geology of popular hikes. Bow Glacier is one of these. The articles will be compiled and published in memory of a geologist who was well known in her passion for public education. The articles are profusely illustrated with pictures of the hike and sometimes the day a hike was done for research was not ideal for photographic conditions. I would like to talk to you about possible use of some of yours. Glad you found this post. And check your email if you’re still looking for photos for your article. Those pale seafoam green shades are gorgeous and quite unique. Looks like a beautiful trip. Seafoam green / turquoise shades are characteristic of the higher elevation lakes in the Rocky Mountain National Parks. I’m not a scientist, but from what I understand, it occurs because really small silt particles from the melting glaciers cause the light to refract in a certain way. The silt settles out as the water flows towards the oceans, so downstream lakes don’t have the same colouration. I have to wonder whether these lakes will lose their distinctive colouration as the glaciers melt away and snow melt / rain become the primary water sources for the lakes. It’s yet another reason we try to get out to enjoy our beautiful mountain parks as often as we can. Great info, love the insight. Thanks. Gorgeous photos. Tempted to pack the hiking gear and head over. It looks a lot more like New Zealand than Australia. Ha ha! We keep talking about heading to New Zealand or Australia for a hiking trip some year. Here’s hoping both our dreams come true some day!